So this is the time of year that I like to make a list for Christmas. In my family we've always tried to make sure we were not getting each other something that was going to just sit in a closet or hang on a hanger. 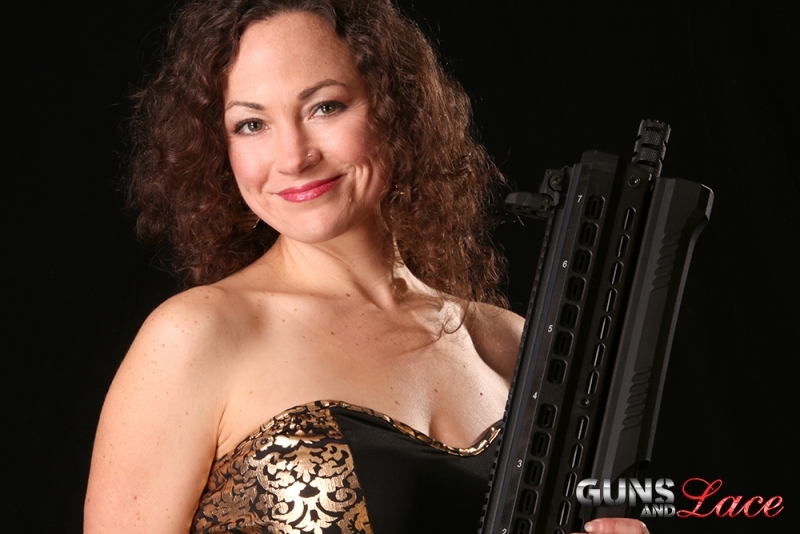 As a shooter, I often have firearm accessories or guns on my list. 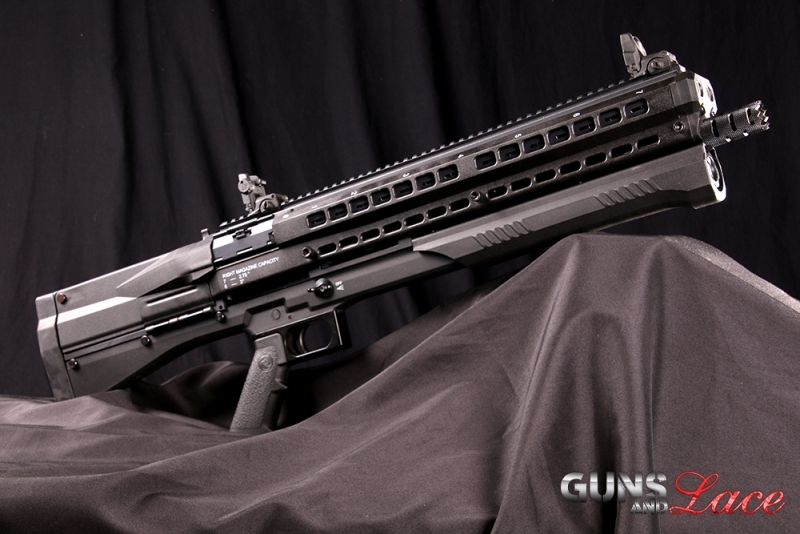 Which leads me to this month's review of the UTS 15 12 gauge shotgun. Now if you are at all a Sci-fi fan, have ever quoted Schwarzenegger's famous "I'll be back..." line, or secretly hope to visit Jurassic Park to fight off a T-Rex, you are going to love this, hunk of a shotgun and its 15 round capacity, and its ability to switch between tubes and ammo. I loved everything about this "ultimate police swat shotgun" except the shear size of the thing. Weight was not an issue as it is primarily made from lightweight high strength polymers, but bulk is another issue. Arnie would laugh, but with my petite size and frame, it was all a girl in high heels could manage to pose with in the studio. Out on the open lot shooting it was more nimble than it felt in front of a backdrop and light rigs. As a pump action, it was smooth, and though I've read some critical reviews about failure to feed, our rifle ate everything we fed it without any issues. We shot double 00, birdshot and a few slugs and it gobbled them up, no problem. I talked to a friend of mine who is on a swat team, about the UTS and he said that while he had no personal experience with it, law enforcement kind of liked the idea of using a selector to be able to switch between rubber ball rounds and lethal rounds. I thought that might be pretty cool, but Lordie, help anyone who got confused on which way the selector needed to go for which ammo. 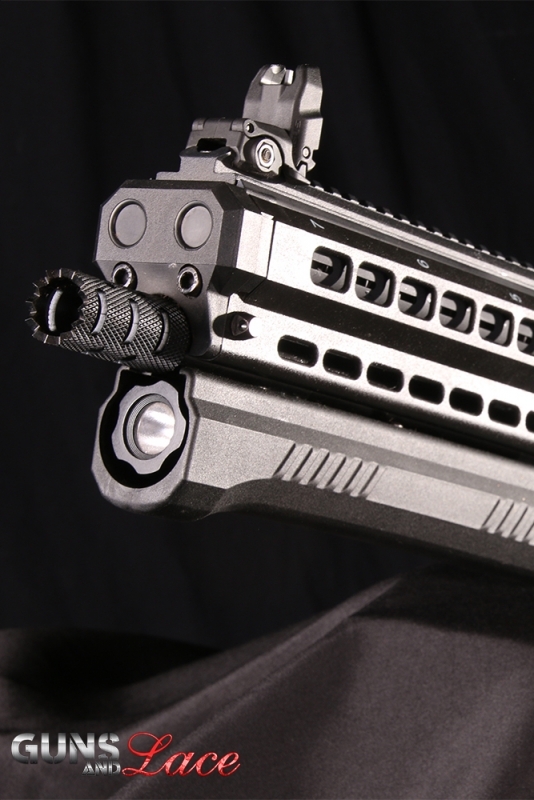 The ammo tubes are located on top of the barrel unlike the UTS 15's closest competitor the Keltec KSG which slings the tubes underneath. The UTS we shot had Magpul flip up sights on it. Honestly, this is pretty much as good as it gets for a close quarters, point and shoot Zombieland style shotgun, but with a picatinny rail on it, go ahead and knock yourself out with whatever optic you need or want. Ours had the optional flashlight and red laser built in, with switches on the side, so if you miss, it is on you. 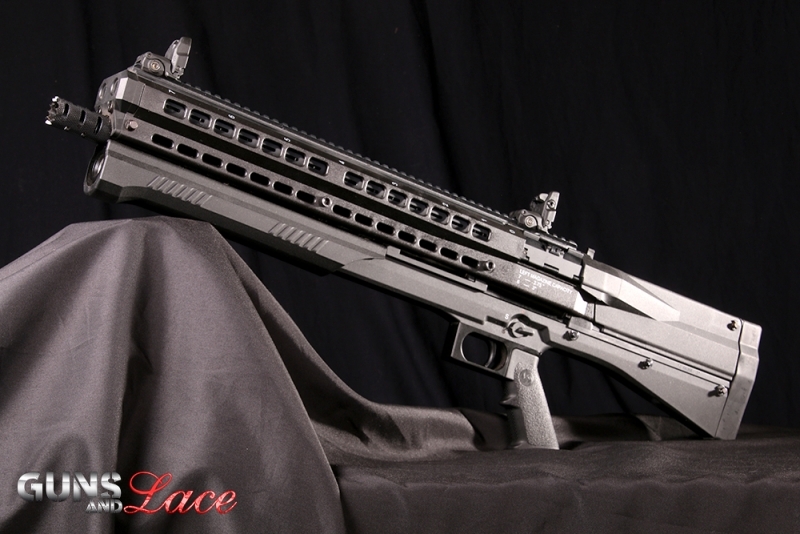 This shotgun gets a "Tacticool" rating that is off the chart!! Recoil was standard 12 gauge fare, with balance being surprisingly good since it is a bullpup, (bullpups have the action behind the trigger so the weight is better distributed). The safety clearly identifies Safe vs. Fire and is easy to operate. An adjustable choke and breech style serration on the business end and what more could a girl ask for on her holiday gift list!? Favorite Quote: You will not be punished for your anger, but by your anger! Entering the scene here at Guns and Lace as a feature model is one very capable young lady, meet marine mechanic and beautiful woman shooter, Katherine. Now is that the perfect combination of skills or what!? 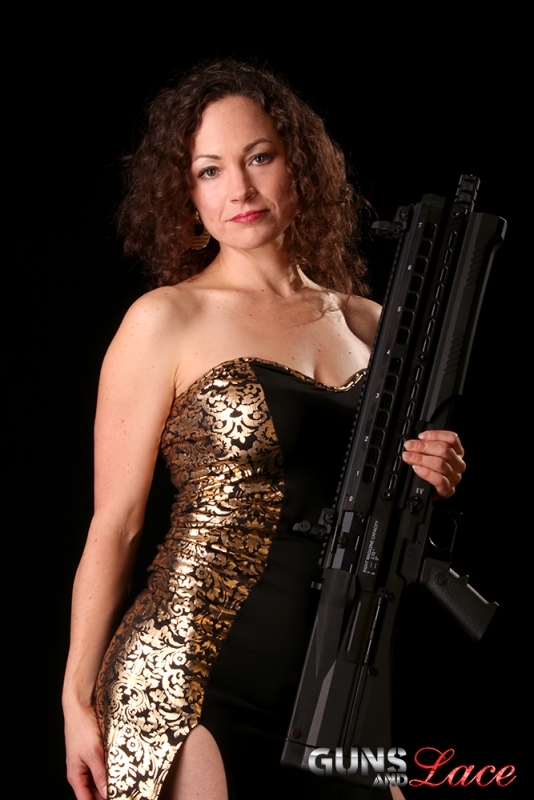 A gorgeous brunette who knows her way around a diesel engine and a shotgun. I can hear our male fans making a collective gasp right now. When not at work or on the range, Miss Skylar is most likely found at the gym working out or in front of a warm fireplace with a good book. Why does she shoot? Her answer was simple, "too many women live in fear, always looking over their shoulder, intimidated by every noise and shadow. Life's too short to live that way. 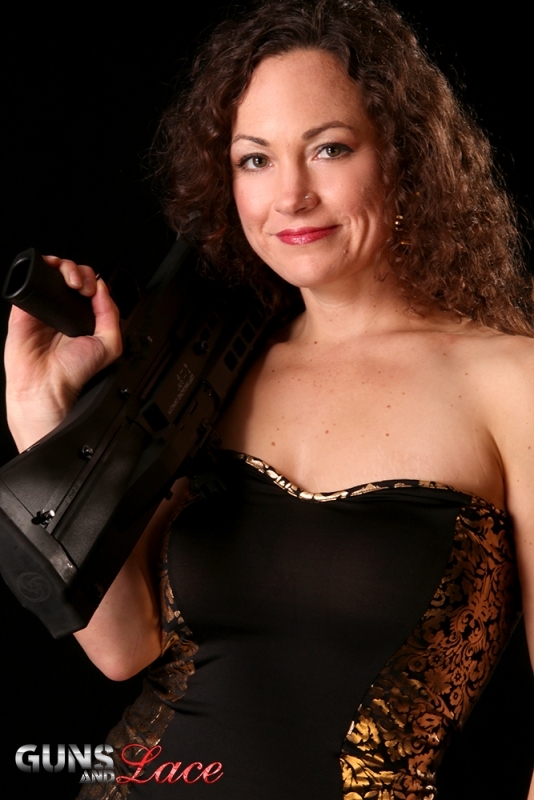 Shooting brings confidence and confidence translates into success whether you wear coveralls or heels to work." Incredibly beautiful and confident. I think you got it right with this one! Katherine Skylar is a one time build. There is nobody else like her. I am attracted by looks and life. I work in maritime environment. She is dangerous to a man's soul. Just what I like.